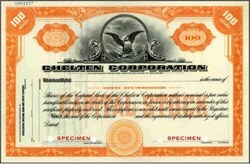 Beautifully engraved SPECIMEN certificate from the Chelten Corporation. 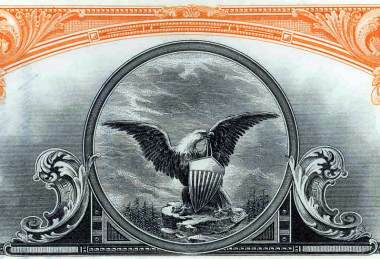 This historic document was printed by the Security Banknote Company and has an ornate border around it with a vignette of an eagle with a shield. The Chelton Corporation was incorporated in 1906 and was acquired by the Guarantee Trust and Safe Deposit Company in 1928. This company was merged with the Tradesmens National and Truse Company in the later half of 1928. PNC Bank Corp. was created in 1983 with the merger of Pittsburgh National Corp., parent of Pittsburgh National Bank, and Provident National Corp., parent of Provident National Bank of Philadelphia. But the many institutions that make up what is today PNC Bank have roots that reach back well into the nineteenth century, and one even dates from the eighteenth century. Pittsburgh National was established as the Pittsburgh Trust and Savings Company on January 28, 1852, and is the oldest bank in Pittsburgh. Within months of its creation, it moved its offices to Wood Street, one door from the corner of Fifth Avenue, and in 1858 the corner lot was acquired. The bank has been doing business at the corner of Fifth Avenue and Wood Street ever since. Officers of the bank played a key role in the passage of the National Banking Act of 1863, and the bank was the first to apply for a national charter, though not the first to receive one. With its new charter, the institution became the First National Bank of Pittsburgh. "It was a very profitable bank and did a large business. It was its policy from the start to help beginners, if capable and honest, without regard to capital. I'd always take an honest man before a rich man, as security; that has been my idea, and I believe it is still the idea of the directors." Provident National's origins also stem from the mid-nineteenth century. One of its predecessor institutions, the Tradesmens Bank, was created in 1847; the other, the Provident Life and Trust Company, was established in 1865 by Quakers as an insurance company. Its charter authorized it to insure lives and conduct traditional trust business. In cashing the checks issued to trust beneficiaries, the Provident Life and Trust Company entered the world of banking. The company used the motto, "Organized and Managed by Friends," and became known informally as "the Quaker bank," an identity that remained with it for many decades into the twentieth century. In 1922 the company split into two independent ones - Provident Mutual Life Insurance Company and Provident Trust Company. The trust company settled on the idea of using artist Jean Francois Millet's "Sower" to symbolize the long-term benefits of prudent investment. Both Pittsburgh National and Provident National grew with their communities and through acquisitions in the first half of the twentieth century. Several mergers in post-World War II era were pivotal for each. In 1957, Provident Trust Company of Philadelphia and Provident Tradesmens Bank and Trust Company merged, creating Provident National Bank. The bank continued to use the name Provident Tradesmens Bank and Trust Company and to use Millet's "Sower" as its symbol until 1964. Across the state, First National Bank of Pittsburgh had become Peoples First National Bank and Trust Company in 1946 through consolidation with Peoples-Pittsburgh Trust Company. And in 1959, a triple merger occurred - Fidelity Trust Company merged into Peoples First, which, in turn, merged with First National. No permutation of the existing names seemed sufficient; a new name - Pittsburgh National Bank - and a new symbol - a triangle that bespoke the industrial and commercial strength of Pittsburgh's Golden Triangle - were created. In 1982, Pennsylvania changed its banking laws to permit statewide banking. The first two banks to take advantage of the law were Pittsburgh National and Provident National. It was the largest bank merger to that time. Taking the shared initials of their holding companies - PNC - they created a new holding company, PNC Financial Corp, and set the stage for rapid growth. A series of intrastate mergers followed, notably with Marine Bank of Erie, Pa., and with Northeastern Bank of Scranton/Wilkes-Barre, Pa., in the mid-1980s. Both banks had distinguished histories dating to the Civil War period and played significant roles in the industrial, civic and social development of their regions. Two small banks outside Harrisburg - The Hershey Bank, Hershey, Pa., and First Bank and Trust Company, Mechanicsburg, Pa., -- joined PNC in 1984 and 1987, respectively, establishing a presence in what would later become the Central Pennsylvania market of PNC Bank. In mid-1986, PNC took a major step, announcing its first merger with an out-of-state banking company, Citizens Fidelity Corporation of Louisville, Ky., which operated in the metropolitan Louisville area, including adjoining Indiana, and the Bluegrass region of Kentucky. Citizens Fidelity Bank, which took root in 1858 as Merchants Deposit Bank, had grown up with Louisville. Like most of the components of PNC Financial Corp, it was the result of the combination of many banks, including Union National Bank, Fidelity Trust Company, the first trust company west of the Alleghenies, and Columbia Finance and Trust Company. Another major acquisition, The Central Bancorporation of Cincinnati, which owned a number of banks in Ohio and adjoining Northern Kentucky, took place in 1987. Begun as a private bank, the Franklin Bank, in 1832 it grew through its participation in the growth of the Queen City as well as through mergers. The familiar Central Trust Company name appeared in 1917, and it established its offices in the Central Trust Tower at Fourth and Vine, a landmark building that helps define the Cincinnati skyline. Though the bank moved its headquarters in 1979, the building still carried the Central Trust name and the neon sign atop the building served as a familiar beacon. This building now caries PNC Bank neon signage. Several smaller Central Trust banks in widely separated regions of Ohio were subsequently sold to Banc One Corporation. The acquisition of Bank of Delaware Corporation in 1989 concluded this stage of PNC's growth. Bank of Delaware traces its roots to 1795, when the President, Directors and the Company of the Bank of Delaware was organized. The business, assets and goodwill of the successor bank were acquired by Security Trust Company in 1930. In 1952, Security Trust merged with Equitable Trust and the name adopted was Equitable Security Trust Co. But in 1958, the bank decided to return to its roots and changed its name to Bank of Delaware. A second stage of acquisitions for PNC Financial began on New Year's Day 1991 with the acquisition of First Federal Savings and Loan Association of Pittsburgh from the Resolution Trust Corp., the agency created by the Federal government to "resolve" the collapse of many S&Ls in the late 1980s. Combining First Federal into Pittsburgh National made PNC the largest bank in the Pittsburgh market as well as the largest bank holding company. Between 1991 and 1996, PNC acquired nine financial institutions in virtually every market where it operated, so-called "in-market" acquisitions that allowed it to bolster its market share and achieve economies of scale in Northwest PA, Northeast PA, Cincinnati and Northern Kentucky, and Philadelphia as well as in Pittsburgh. But there were some entries into new markets as well. The purchase of CCNB Corporation, a major bank in the Harrisburg, Pa., area, gave substance to the small market position in that area, and together with the purchase of United Federal Bancorp of State College, Pa., created what is now the Central PA market of PNC Bank. Even more significant was the bank's achievement of a longtime goal of entering New Jersey. The desire of Chemical Bank to sell off a major portion of its New Jersey franchise presented the right opportunity in 1995. Four months after announcing the Chemical transaction, PNC and Midlantic Corporation, which operated Midlantic Bank throughout New Jersey and the Philadelphia area, announced they were joining forces in a $3-billion merger that would catapult PNC Bank to a solid No. 2 position in the southern New Jersey/Philadelphia area market. Two bank acquisitions added to PNC's growing Private Banking business. The Massachusetts Company, Boston, the oldest trust company in the country, dating from 1818, counted John Quincy Adams, Daniel Webster and Henry Wadsworth Longfellow among its clients. The purchase of Indian River Federal Savings Bank of Vero Beach, Fla., allowed PNC to add private banking capabilities to its existing Florida trust business, which was a legacy of Northeastern Bank. There were also two major acquisitions of non-banking companies during this period - the Sears Mortgage Company, which Sears, Roebuck & Co. wanted to divest as it focused on its core retailing business - and BlackRock Financial Management, one of the nation's leading managers of fixed-income investments. PNC combined Sears Mortgage, a major mortgage organization operating in 30 states, with its existing PNC Mortgage operations to create one of the nation's largest mortgage originators and servicers, headquartered in Vernon Hills, Ill.
BlackRock became a part of the PNC Asset Management Group, the line of business responsible for managing more than $100 billion for institutions and individuals. PNC's preeminence in money management was built on the strong trust capabilities of Provident, Pittsburgh National and other members of the PNC family. There were internal changes, as well, at PNC. One important one was the decision in 1990 to move the company from separate technological platforms operated and controlled by each bank to a single common technological platform. That permitted a common set of products and services to be offered to customers, wherever they were located, and also permitted the bank to capture the benefits of centralization of many so-called back-office operations. Though banking laws still required separate charters in many states, there was nothing that prevented all the entities within PNC from acting like one bank. At the same time, PNC was also changing its organizational focus from a geographical one to one based on "lines of business" - Corporate Banking, Consumer Banking, Asset Management, Mortgage Banking and Real Estate Banking. The growing number of banks and other entities within PNC Financial, each with its own name and marketing program, began to be cumbersome and inefficient. When the merger was fresh, each institution used to identify itself, in small, fine type, as "an affiliate of PNC Financial Corp." Later each adopted the sub-identity "A PNC Bank." Now with the banks acting like one bank, one name began to make more sense. And, in 1993, the company changed its name to PNC Bank Corp. and each of the banks became known as PNC Bank.